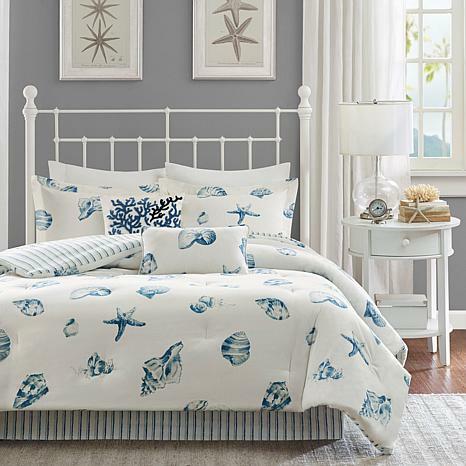 Bring a sense of the calming sea side into your home with this beautiful shell pattern. 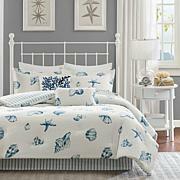 It's printed in shades of blue onto a white, cotton brushed twill and reverses to a yarn-dyed stripe in blues and white. All you need is the salt sea air. Fabric Care: Machine wash cold on gentle cycle; do not bleach. Tumble dry low. Do not iron. i just got my set I love it . 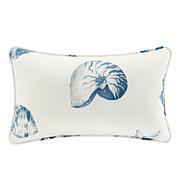 It is great quality and stylish I give it 5 stars the accent pillow are great as well. The ;price is great too.